ISLANDERS want an increase in the number of seabird chicks they can kill in a bid to meet demand for one of Britain’s strangest delicacies. 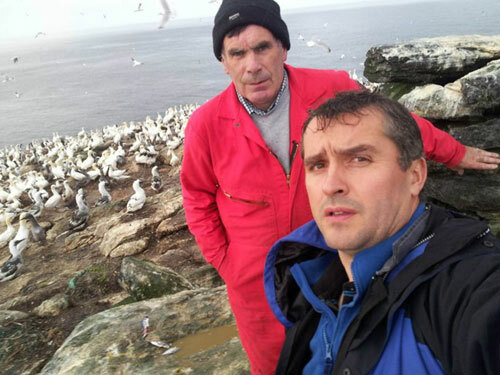 The guga hunters of Lewis say the current restriction of 2,000 baby gannets a year should be relaxed. Defending MP Angus MacNeil has written to Scottish Natural Heritage (SNH) saying an increase in numbers is justified because bird colonies are growing in size. SNH has confirmed it will consider any request for an increase in the number of gugas – the Gaelic word for gannets – the hunters are allowed to take. Restaurateurs have also shown interest in getting hold of the delicacy with customers keen to experience its pungent and distinctive taste. But the hunt, in which the baby gannets are clubbed to death, has been condemned as “abhorrent” by the Scottish SPCA, which wants a complete ban on the killing. 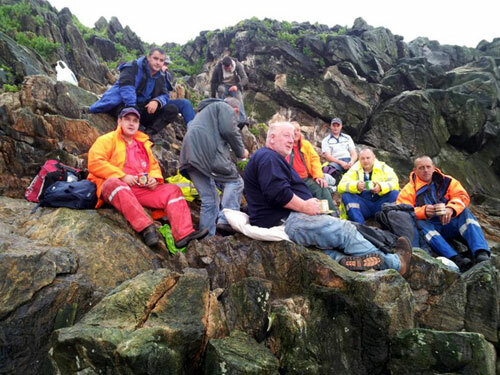 For more than 400 years small group of men from the village of Ness on the Isle of Lewis have travelled to the island of Sula Sgeir – one of the most remote in the British Isles. The gannet chicks are harvested from the cliffs over ten days, killed by a blow to the head, and salted before being transported back to Lewis. The taste is sometimes described as a “fishy tasting seabird”. Adored by some others are unable to even swallow the meat – as several YouTube videos demonstrate. Even though guga is only the size of a small chicken they sell for about £16 each. And to be in with a chance of getting one of the 2,000 birds killed annually, your name has to be on a list held by one of the hunters. No specific quota has been mentioned but the islanders were once allowed to take 3,500 guga annually. Angus MacNeil, defending MP for the Western Isles, last week wrote to Susan Davis, Acting Chief Executive of SNH, on behalf of the “men of Ness”. He wrote: “I understand that your recent publication states that the colony on Sulas Sgeir increased by 2.2% p.a, reversing the change over the previous 10 years and that the number of gannets Sula Sgeir has been relatively stable over the last 30 years. Mr MacNeil said yesterday: “More guga die in their first winter than are taken by the traditional hunters who have been going to Sula Sgeir for at least the last 400 years. He added: “There will be modern people who get food wrapped in cellophane from supermarkets who won’t like it. But there will be many more who understand it and support the guga hunters. 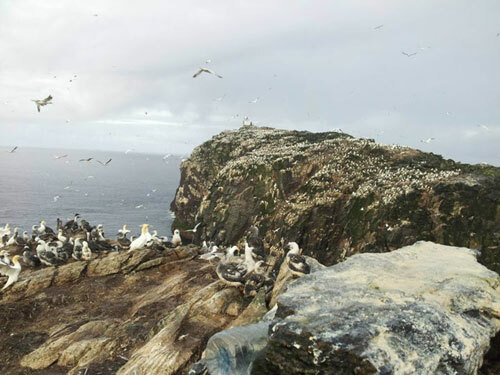 The guga hunters of Lewis are currently restricted to 2,000 baby gannets a year. Guga hunters distrust national media and declined to comment. But head guga hunter John ‘Dods’ Macfarlane recently told a local reporter: “I’ve been telling them for years the numbers were rising. “They wanted scientific evidence – well, they’ve got it now. Recent figures revealed there are more than 11,000 gannets on the tiny island with the numbers increasing by more than 2% every year. Shirley Spear, owner of the Michelin starred Three Chimneys restaurant on Skye, said: “I don’t think I’ve seen it outwith the Isle of Lewis. “I think people would be interested to taste it – they are so interested in it. Guga hunters and Angus MacNeil on Sula Sgeir. But Scottish SPCA Chief Superintendent Mike Flynn said: “We oppose the cull on the manner it is carried out. “The birds killed during the annual guga hunt are struck on the head with a heavy implement and we believe this is an abhorrent method which should be banned. “Although the licence issued for the hunt states that the birds must be killed humanely, we are concerned that some may not be killed by a single blow. Any unnecessary suffering caused to the birds would be an offence. 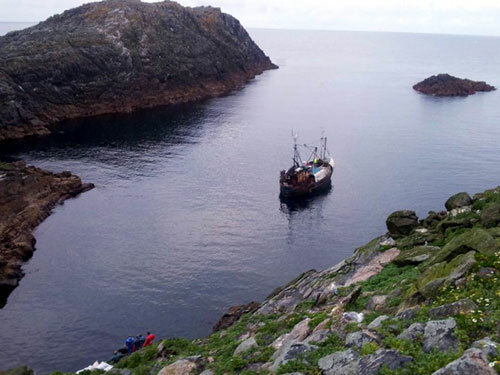 “We appreciate that guga hunting was a way of life for the people of Ness and that gannet chicks were an essential food supply hundreds of years ago. 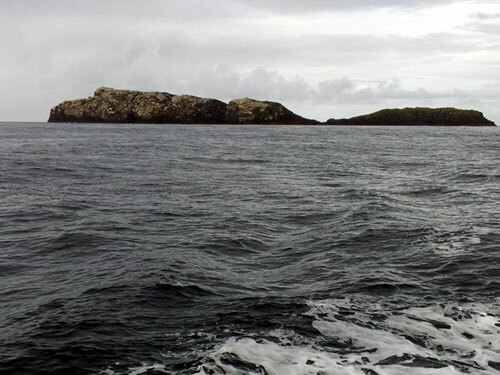 The island is one of the most remote in the British Isles. A spokesman for SNH said: “We need to ensure that the cull target is set at a sustainable level. He added: “The survey data is good news as it demonstrates that gannets are faring fairly well. “Traditionally it is Guga and potatoes and people wash it down with a pint of milk because of the salt in it,” said Allan MacRitchie, the 32-year-old head chef at Borve house in Ness, Isle of Lewis. “It’s like marmite – love it or hate it. 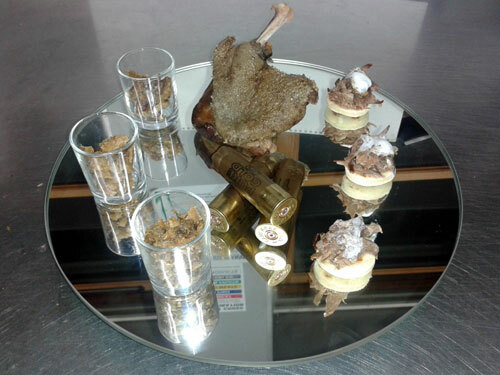 Guga crackling served in a shot glass, a quarter of guga and guga canapés – garnished with used shotgun cartridges. He has also experimented with more complicated recipes. Pictures show his creation of guga crackling served in a shot glass. The quarter of guga and guga canapés are garnished with used shotgun cartridges. Couldn’t they just burn a Viking longship like everyone else?